The marine generator, electric propulsion, air-conditioning, watermaker, and power monitoring and control supplier is bringing its latest technology and equipment direct to boaters with live demonstrations and the chance to see, hear and operate the products for themselves. 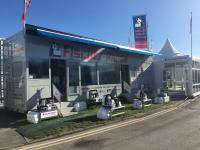 A regular feature at the show since 2003, the Fischer Panda demo-trailer on Stand E020 has been refurbished and enhanced for 2018 to showcase the company’s integrated system approach, which now encompasses CZone digital switching alongside its well-renowned quiet-running gen-sets, HRO/Village Marine and Sea Recovery watermakers, Dometic air-conditioning and Mastervolt solutions. Simulating on-board operation of the equipment on the water, the enhanced interior will offer an easy way for visitors to engage and participate in testing the functionality of the individual products and to understand the benefits of maintaining oversight of vessel systems. Fischer Panda experts will also be available to offer advice on product selection and installation, and to answer any specific questions from boaters. Chris Fower, Sales and Marketing Director, Fischer Panda UK, said: “Our demo trailer provides visitors with a unique opportunity at the show to see the true functionality and features of the products while in operation. We always get a very positive response from people, so we decided to invest in an upgrade this year so that we can incorporate and integrate all our current and new product lines and technology. Announced as a UK distributor for CZone last year, Fischer Panda’s digital switching offering enables boat owners to simplify their boat’s electrical system by managing on-board equipment, such as generators, watermakers and HVAC, and changing the environment via a single touch-screen display or wireless device. The Verwood-based supplier can now supply its compatible Mastervolt power solutions and CZone control and monitoring functionality for customised system integration around a Fischer Panda generator purchase. 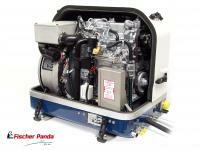 Fischer Panda’s line of diesel gensets, which are suitable for vessels ranging from RIBs to superyachts, are the quietest and most compact marine generators available. The units run at a noise level of between just 52db(A) and 55db(A) at a 7m distance, depending on the capacity and type of the model. Units up to 25 kW feature a GRP sound insulation capsule with a 3-layer, 25mm thick ‘3D’ sound insulation material as standard, with a thicker 5-layer version also available. Generators from 25 kW and above are supplied with a stainless steel sound-insulation Metal Professional Line (MPL) capsule. The MPL capsules are offered at an extra cost for generators from 6 kW to 25 kW. The newer Panda 5000i and 4000s Neo generators use Fischer Panda’s in-house designed water-cooled FPE320 single cylinder diesel engine which features integrated oil filter and synchronous alternator for even lower running noise levels and reduced vibration. Fischer Panda’s variable speed iSeries ‘Perfect Power’ range incorporates next generation technology that improves fuel efficiency and benefits the environment. Live demonstrations will be available at 11:30am every day at Fischer Panda Stand E020.